You can now earn Points with MySavings Rewards when you share a photo or video with your friends on Facebook, Instagram or Twitter. Login to your MySavings Rewards account and click "Earn Points" to get started. Be sure to follow all of the requirements before submitting a link to your post. Received a Free sample in the mail that you found on MySavings.com? - Share it with a Video! Excited about a deal you just scored from our site? - Share it with a Photo! Don't forget to follow MySavings.com on Facebook, Instagram and Twitter - we are always sharing our latest freebies, coupons and deals that we have received! 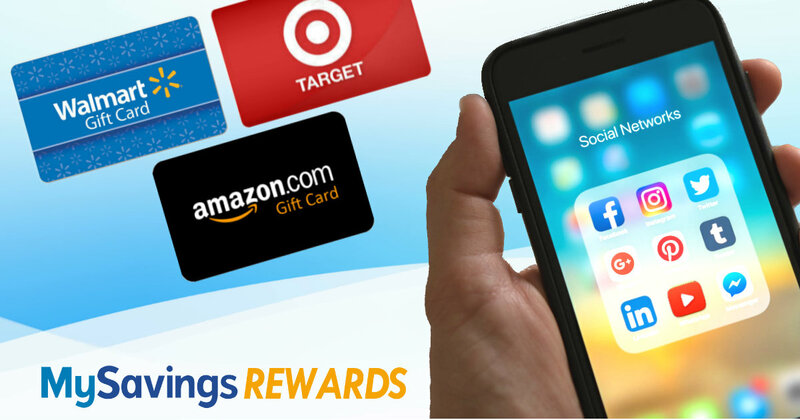 With MySavings Rewards you can Earn FREE gift cards for completing easy tasks like logging in daily, signing up for an offer in our daily newsletter and showing off your free samples with friends. In the upcoming weeks we will be rolling out even more ways to earn points so check in daily! Earn 1000 points when you Sign up!